Salewa has arrived! And with it, it’s brought some of the best fibre technology available. Our range for this autumn winter season consists of 2 of their best down jackets plus, 2 women’s styles that utilise Salewa‘s very own Tirolwool® Celliant® hybrid combination. Born and raised in the Italian Dolomites, Salewa has long been a company focussed on pure mountain life. Since being founded in 1935, Salewa’s designers have been inspired by the Dolomites and the activities in the Dolomites to fine tune their products and focus on the future of mountain sports. You can see it in the innovation that they put into their designs and materials and also the mountain sports that they choose their brand ambassadors from. 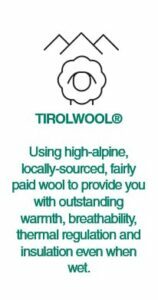 Take for instance how they blend local Tirolean wool into their mix of insulation solutions. Their focus on utilising new and sustainable technologies is to be admired, and long may it continue. 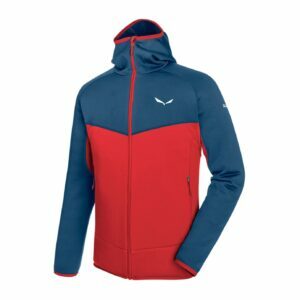 Salewa’s Puez TirolWool® Celliant® Hooded Jacket is designed to provide weather protection and insulation for alpine trekking and exploring wild and inaccessible places in the mountains, in colder conditions. It has a highly-functional, intelligent design that combines a wind-resistant, water-repellent, cotton-touch nylon outer fabric with TirolWool® Celliant® – Salewa’ new proprietary reflective hybrid insulation. 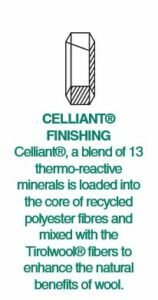 TirolWool® Celliant® is a unique low-bulk insulation that recycles radiant body energy (heat) into infrared light and converts, stores and reflects it back to the body. TirolWool® Celliant® works during activity, but also carries on working during static situations thanks to its longer heat retention and infrared reflection. 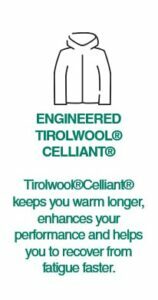 In addition, TirolWool® Celliant®’s unique properties last the lifetime of the garment. They will not wear off or wash out since they are embedded in the fibres. And the insulation keeps you warm, even when it gets wet. 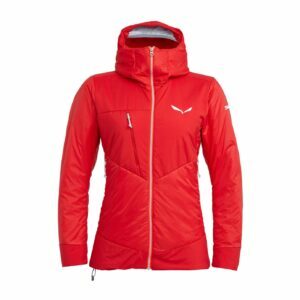 The Salewa Puez TirolWool® Celliant® Hooded Jacket has strong sustainability credentials. Its outer fabric is certified bluesign® approved and has a PFC-free DWR finish. 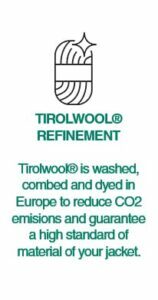 TirolWool® is a natural, sustainable material sourced from local sheep and Celliant® is made from polyester yarns, 70% of which are recycled from European post-consumer waste. This jacket has a regular fit, but is cut with a special gusseted sleeve design for greater freedom of movement. The comfortable, tailored hood has elasticated binding for a snug fit, as do the cuffs. The Ortles TirolWool® Celliant® Jacket is a warm, wind-resistant and water-repellent jacket for alpine mountaineering, ski mountaineering, glacier mountaineering, ice climbing and more with a nylon ripstop shell and Powertex Extreme reinforced shoulders. 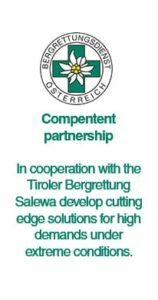 TirolWool® Celliant® is Salewa’s proprietary lightweight, soft insulation material that combines wool from Tirolean sheep and innovative polyester fibres enhanced with thermo-reactive minerals. Heat emitted by the body is absorbed and converted into infrared radiation, which is stored and reflected back to the body – keeping you warmer for longer. And the soft, fleecy material is highly compressible, so your insulation remains packed down small in your backpack until you need it. 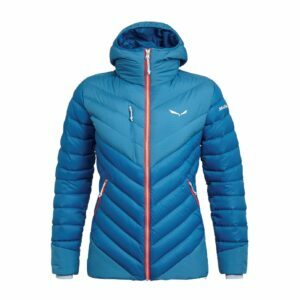 Featuring free motion patterning to prevent hem-lift while climbing and designed according to the SALEWA® body mapping system, it can be worn alone as a warm outer layer or as an insulating mid layer under a shell. With an insulated, fitted hood with integrated high storm collar. The Women’s Ortles Medium 2 Down Jacket is a warm insulation layer for alpine mountaineering that combines duvet warmth with minimal pack size. Whether used as an insulating mid layer or as an outer layer, the 3D box chamber construction, 730 cuin 90/10 Responsible Down Standard duck down fill and TirolWool® Celliant® hybrid insulation inserts are positioned specifically to provide the right amount of heat retention required by different parts of the body. TirolWool® Celliant® also continues to keep you warm even when it is wet, which is why Salewa uses it at the hood, shoulders and cuffs. The lightweight, abrasion-resistant nylon ripstop outer fabric is ideal for alpine use. With a tailored, rear-adjustable hood and high collar for maximum storm protection. Featuring Salewa’s free motion patterning and ergonomic sleeves and shoulders to prevent hem-lift while climbing. Packs down small into its compression stow bag. 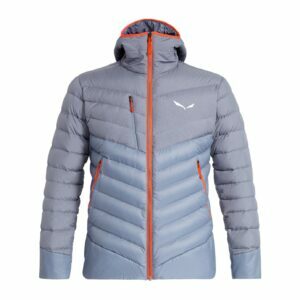 The Men’s Ortles Medium 2 Down Jacket is a warm insulation layer for alpine mountaineering that combines duvet warmth with minimal pack size. Whether used as an insulating mid layer or as an outer layer, the 3D box chamber construction, 730 cuin 90/10 Responsible Down Standard duck down fill and TirolWool® Celliant® hybrid insulation inserts are positioned specifically to provide the right amount of heat retention required by different parts of the body. TirolWool® Celliant® also continues to keep you warm even when it is wet, which is Salewa uses it at the hood, shoulders and cuffs. The lightweight, abrasion-resistant nylon ripstop outer fabric is ideal for alpine use. With a tailored, rear-adjustable hood and high collar for maximum storm protection. Featuring Salewa’s free motion patterning and ergonomic sleeves and shoulders to prevent hem-lift while climbing. Packs down small into its compression stow bag. 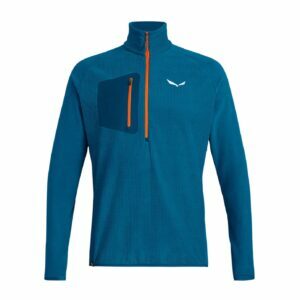 The Pedroc 2 Stormwall Durastretch Jacket is a hybrid softshell that combines different fabrics to offer protection for speed hiking and high-octane outdoor activities in colder conditions. Developed together with Salewas athletes, who regularly train in the Dolomites, this jacket benefits from Salewa’s body mapping design, which matches different fabrics to different parts of the body for targeted performance at each area. The Pedroc Hybrid Jacket combines water-repellent, windproof and breathable 3-layer Stormwall softshell fabric for weather protection with 4-way stretch Durastretch fabric for freedom of movement. 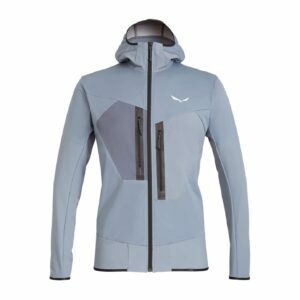 The Pedroc 2 Stormwall Durastretch Jacket also features Salewa’s free motion patterning to prevent hem-lift and a slim, athletic fit to ensure comfort and protection during fast and dynamic movement. Built for simplicity and protection for mountain day hikes and more, its special sleeve design allows good freedom of movement and the regular fit layers nicely beneath a shell. With snug elastic cuffs and hem to keep the wind out and flatlock seams for extra comfort. Built for simplicity and protection for mountain day hikes and more, the ergonomically shaped sleeves allow good freedom of movement and the regular fit layers nicely beneath a shell. With snug elastic cuffs and hem to keep the wind out. 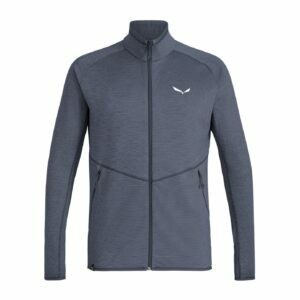 One of Salewa’s lightest fleeces, it’s made from hybrid waffle Polarlite fleece. The two-way stretch fabric wicks moisture effectively, is quick drying and easy-care.